The drama between gospel musician Ernest Opoku and Kumawood actress popularly known as Nayas seem to escalate as the day goes by. Nayas has recently made claims that Ernest Opoku takes tramadol every time before performing on stage. 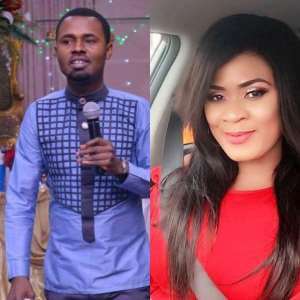 In a video circulating on social media, Nayas was very furious and revealed other things about Ernest Opoku saying she dated the gospel musician and knew him better than anyone else. Some people claim that Nayas, ex-girlfriend of Ernest Opoku is bitter since their breakup and will do or say anything to tarnish the image of the gospel artiste.